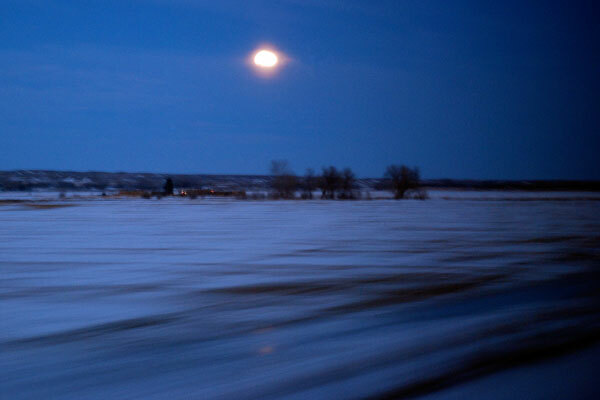 One more quick photo from my recent eastbound Amtrak journey across northern Montana ... an almost-full moon over a lonesome farm in the Milk River valley, somewhere between Havre and Malta. 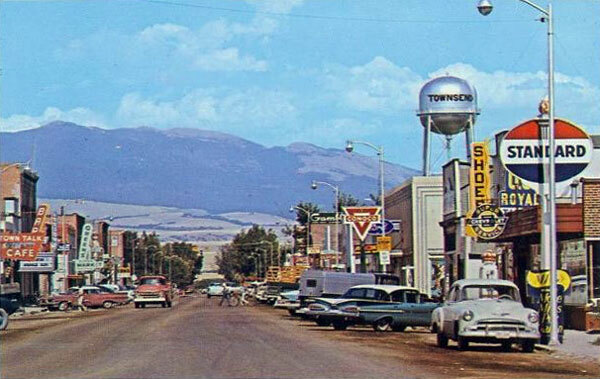 I freely admit that there are towns in Montana that I like more than Havre ... lots and lots of them, actually. But there are definitely still some things worth seeing up that way. This is a photo I took recently of one of my favorites ... an old Great Northern steam locomotive on display just west of the depot. The 2584 was built back in 1930 for service on the GN's crack long-distance passenger trains, and it's been guarding the Havre depot since 1964. At least from the standpoint of a photographer, it's usually far more interesting to hang out in alleyways rather than city streets ... and that's true even in a little town like Shelby. 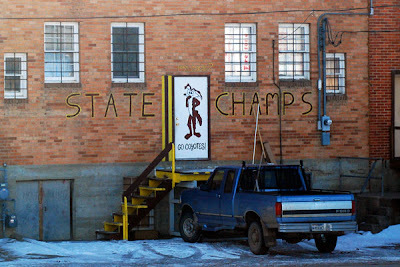 I photographed this backdoor tribute to the town's high school athletes from the windows of the Empire Builder a few days ago. I wonder if Warner Brothers knows about this? 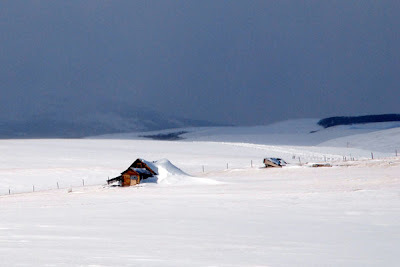 Montana is a state of extreme weather, and the Hi-Line country often has some of the most difficult weather of all. The wind up there makes everything more dramatic ... especially in the winter, as the snowdrifts constantly grow and shift and make life challenging. I saw this old house from the train last week, between East Glacier and Browning. It was a dramatic morning -- lots of wind and sun on the prairies, but the Glacier mountains almost completely hidden in the clouds. 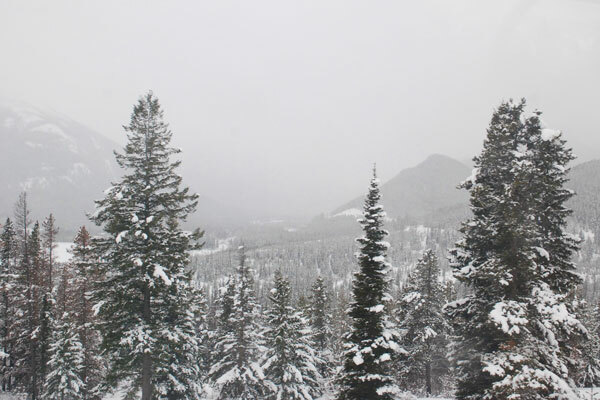 A quintessential winter day in northern Montana. I've driven over Marias Pass a million times, in all seasons ... and as lovely as the trip is, I admit that it's gotten old hat by now. Mostly when I drive it, I'm just trying to make time. The railroad line used by Amtrak's Empire Builder also crosses Marias Pass, of course, but I've only ridden a train across the pass a few times. And even though the tracks nearly parallel the highway, differences in elevation and angles make the ride a wholly different experience than the car trip. Much more interesting, I think -- and of course the views are easier to appreciate because the speed is lower and one doesn't have to think about driving. 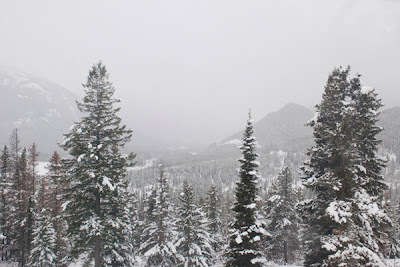 My train ride over Marias Pass last week was cold and grey, but still thoroughly spectacular. Here's a shot from the trip, taken high on the western approach to the summit. I wrote up the last few days of airline posts before heading out on a trip last week ... one that, ironically, turned out not to include any air travel. My journey ended up being somewhat reminiscent of an old Steve Martin/John Candy movie, but it did give me a chance to take more Montana photos, and I'll share some over the next few days. 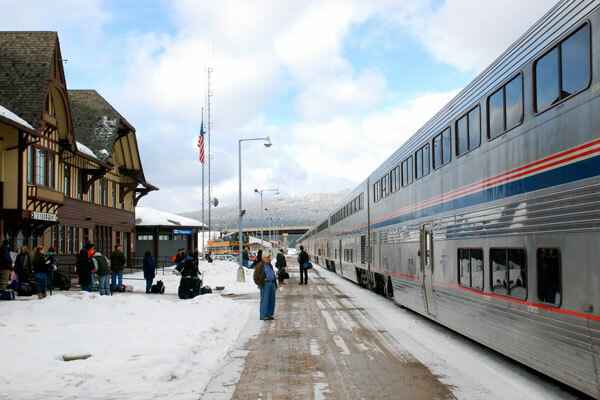 Here's where the trip began -- boarding the eastbound Empire Builder in Whitefish. There's no better place to start a journey ... the Whitefish depot is a beautiful and historic building, and the Empire Builder is by far the most civilized way to travel through our state. Even in the high-tech 21st Century, there are few things more exhilarating than boarding a long-distance passenger train. One last aviation post this morning, before we move on to other forms of travel. This photo records an exciting moment in the history of the town of Cut Bank -- the arrival of commercial airline service to the city on June 1, 1941. The flight was a northward extension of Western Air Lines' route up to Great Falls ... after stopping in Cut Bank, the service continued on to Lethbridge, Alberta, where one could connect with flights to other Canadian destinations. Cut Bank has the dubious distinction of being the only community in Montana to have lost commercial airline service in the modern era. Western pulled out in the late 1960s, leaving the town's travelers back in the capable hands of the Great Northern Railway. 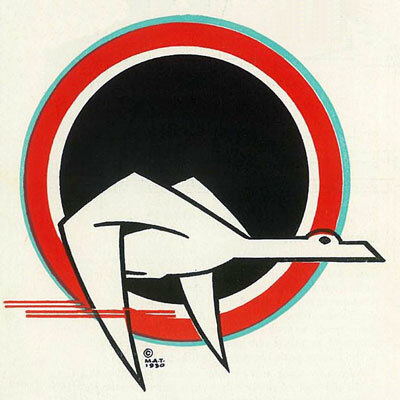 Many of the early airlines in this part of the world used classic western or American Indian images in their logos and advertising, but few did it as well as Western Air Lines in its early years. 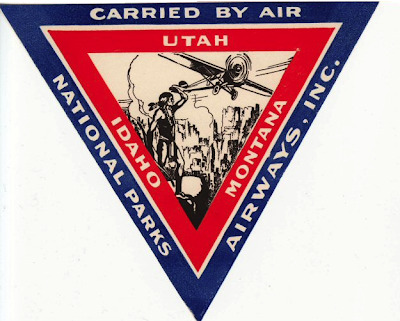 Starting out as Western Air Express, the company acquired National Parks Airways in 1937 and inherited its north-south route through Montana. 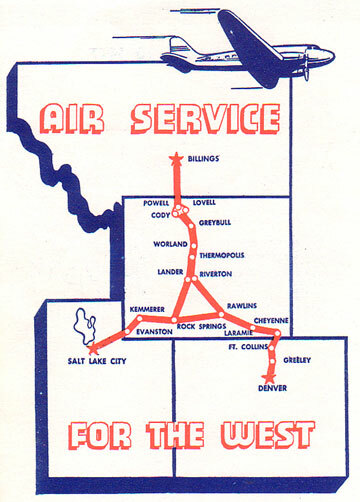 They acquired Inland Air Lines in 1944, adding Inland's route from Great Falls to Lewistown, Billings, and beyond. Whoever designed the old Western Air Lines timetables must have been a fan of the Great Northern Railway, since the Indian Chief artwork is strongly reminiscent of the GN's promotional material of the era. It was much classier than the cartoon bird that Western used in its TV advertisements when I was a kid ... though I have to confess that I quite liked that, too. Here's a wonderful old sticker issued by a company called National Parks Airways, probably the first commercial airline to operate in Montana. NPA began carrying passengers and mail between Salt Lake and Great Falls in 1928, stopping in Butte and Helena along the way. For a time in the 1930s, the airline lived up to its name by detouring its flights via West Yellowstone in the summer, landing at a little grassy airstrip right at the edge of town. The airline's later stickers employed a flying-eagle logo, but the Native American iconography on this one is very cool, I think. Here's another airline you've probably never heard of. Challenger Airlines operated only from 1947 to 1950, with a small fleet of DC-3s that carried passengers and mail from Billings south to Salt Lake and Denver. 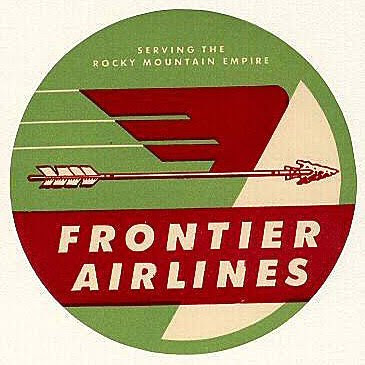 Challenger later became part of the old Frontier Airlines, a fondly-remembered company that was the primary airline in eastern Montana until the 1980s. I did a series of posts last year featuring historic railroad-related advertising and graphic art ... so in the spirit of granting equal time I thought I'd do a few airline posts over the next few days. Not quite as cool as the train stuff, but pretty interesting nonetheless. Today's graphic is the logo of an airline you've almost certainly never heard of: Mamer Air Transport. The company was founded in the late 1920s by Nick Mamer, one of the Pacific Northwest's most intriguing aviation pioneers ... he's best remembered for piloting a biplane called the Spokane Sun-God on a world-record, nonstop 7,200-mile flight in 1929. By 1930, Mamer Air Transport had pioneered one of the first long-distance airline routes across Montana. Dubbed "The Northern Airway," the route combined daytime air travel with overnight train journeys to enable faster travel between Chicago and the Pacific Northwest. 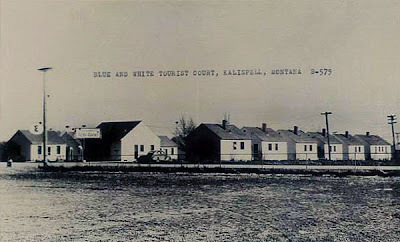 Passengers took a night train to Minneapolis, boarded a "Buhl Air Sedan" for an all-day flight to Spokane, and then caught a second overnight train the rest of the way to the coast. The plane's Montana stops included Miles City, Billings, Butte, and Missoula, and passengers were treated to lunch at the airport in Miles City. The Northern Airway route apparently operated only briefly, made obsolete by ever-faster aircraft and advances in nighttime flying. By the early 1930s, Mamer had abandoned his venture and taken a job as a Northwest Airlines pilot, flying nearly the same route across Montana. And in January 1938, Mamer's plane crashed in the Bridger Mountains north of Bozeman, killing all aboard ... the state's first commercial airline disaster. That night at midnight I walked down a hill to the Milwaukee yards. It was pitch dark. A long freight pulled in; it proved to be a string of empties bound for Seattle. I climbed in a side door, lit a match, looked the floor over and sat down in a corner. 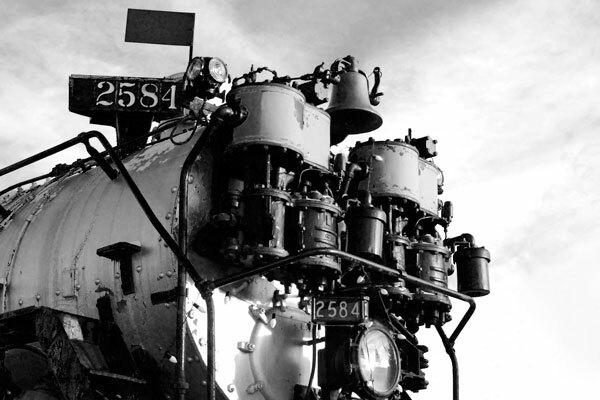 I lit my pipe and smoked quietly while waiting for the engine to whistle the "highball." The con went by checking up his cars. He pulled the side door open that I had taken pains to shut. He stuck his head in the doorway and peered into the corners as he flashed his lantern. Finally the light rested on me. "Hey there! What you riding on?" 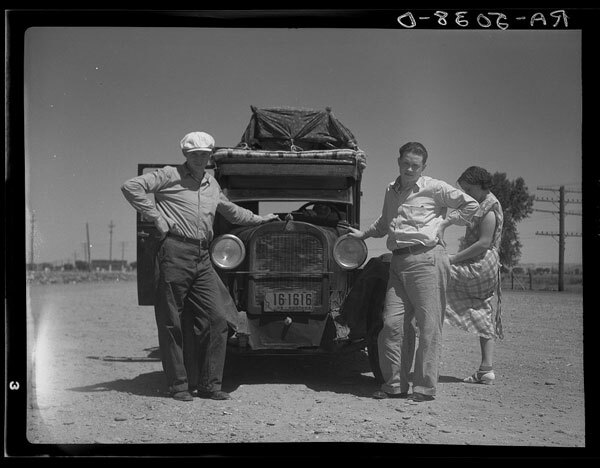 I got up rather unconcerned; I knew that I would get out of town even if he put me off. He looked at my card and pulled the door shut, yelling "Empty," as he hit the door with his stick. In a few minutes the engine whistled the "highball," a long and a short whistle that means "All hoboes aboard." The steam tightened, one succession of bumps was telegraphed down the string of empties, then no noise except the clicking of the rails, the rattling of the cars, and the steady puff of the engines. I lay curled up in the corner and thought of the job that I had left, of Butte, of my destination. I felt lonely. As far as I knew I was the only passenger on the entire freight. After what seemed like a couple of hours she slowed down and stopped. I was getting cold by this time so I got out. I was in Deer Lodge. In about an hour she started out again and I held her down all day and night getting off only at division points for meals. I found that there were between fifteen and twenty hoboes scattered about various parts of the train. Many had been on the train ever since she left St. Paul. 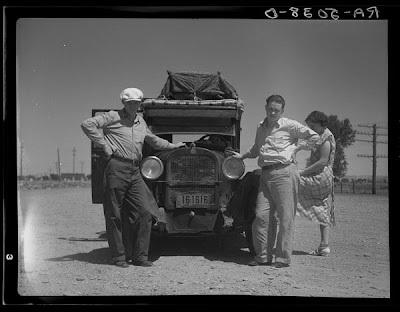 Most of them were going to Washington to harvest the fruit and grain crops. Soon I was traveling through the picturesque route that the Milwaukee boasts of. The hobo gets a better chance to appreciate the beauty of the route than the man that travels on the limited. 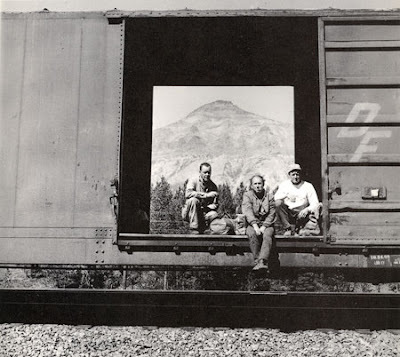 We were all sitting in the doorway, and looking over the freight I could see feet hanging out of almost every boxcar. At a stop a shack went by and seeing us all hanging out of the side doors yelled, "What the hell do you fellows think this is—an open air picnic?" We grinned and shut the doors, but as soon as she started the doors would invariably be opened again. 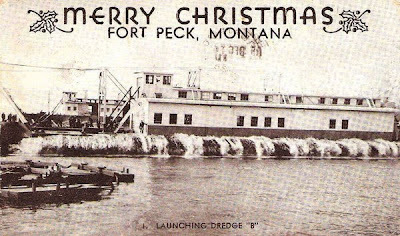 A new online acquaintance named Steve Bixby was kind enough to send me some historic Fort Peck images recently ... and though I should have probably held this one till Christmastime it was cool enough that I wanted to post it now. Thanks, Steve! This was one of the giant dredges that dug up Missouri River sediment near the Fort Peck damsite ... the dredge material was carried in pipelines to the construction area, and used in building the earth-fill of the new dam. This postcard photo probably dates from 1934 or so. Eating pizza with a friend on Saturday night, the subject of Polebridge came up ... and that was impetus enough for me to dig up another photo from one of my favorite parts of the world. I took this shot last fall during an early-morning drive up the North Fork valley -- this is a mile or two south of Polebridge, looking east towards Glacier Park. 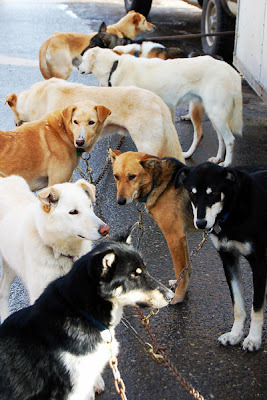 Today is a big day ... if you happen to be a Montana sled dog. The 25th running of the Race to the Sky is underway, the mushers and their dogs heading out from Lincoln this morning on the primary leg of their 350-mile dogsled trek. Here's a photo I took of one of the teams on Friday, when they were hanging out in Butte during a pre-race PR event. Just a quick follow-up to yesterday's post ... an old postcard photo showing that the Blue & White motel definitely has some tenure. I'd guess that this photo was taken back in the 1940s or so, and the buildings in it still appear to form the core of the current hostelry. There's no doubt in my mind that a good dog is the perfect companion for a long roadtrip ... though having a dog along brings with it some complications. 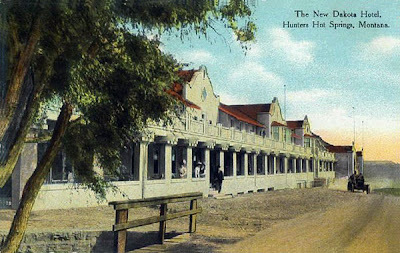 It limits one's choice of motels, for one thing -- a surprising number of unfriendly innkeepers discriminate against dogs, and therefore lose my business. Often, I end up at the older, Mom-and-Pop motels, where dogs are more likely to be welcomed. Such places are a little more threadbare, but sometimes make up for it in character. When Charlie the Dog and I headed up to the Flathead Valley last fall, we ended up staying at exactly such a place -- the Blue & White Motel. It was the low-end motel of choice way back when I was a college kid working in Glacier, and it's still going strong today. 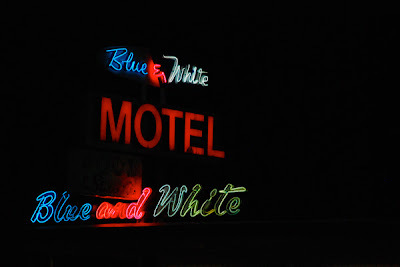 And besides being dog-friendly, the Blue & White has an absolutely wonderful neon sign ... something that a 21st-century hotel chain could never hope to match. Ordinarily, I'm not a fan of people taking quotes out of context ... but I'm going to blatantly do it today, just this once. I've never believed it's about the journey; for me, it's always been the destination that counts. My destination was Montana, so I wanted North Dakota to disappear. 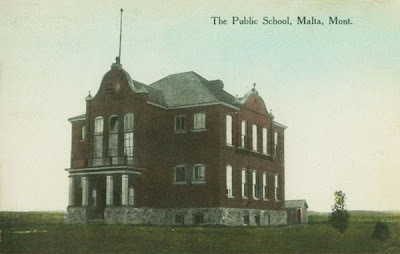 The phrase, "They don't make them like that anymore," applies to a lot of things in today's world ... and it's definitely the case for schoolhouses. While I'm sure there are technical advantages to some of the ones they're building nowadays, pretty much all of the new ones are thoroughly uninspiring in their architecture. That certainly wasn't the case a century ago, when nearly every small-town schoolhouse was a local architectural landmark. This photo of the old school at Malta is the perfect example -- what a gorgeous structure that was! The nondescript buildings that replaced it may be more efficient, but in terms of inspiration they certainly can't compare. 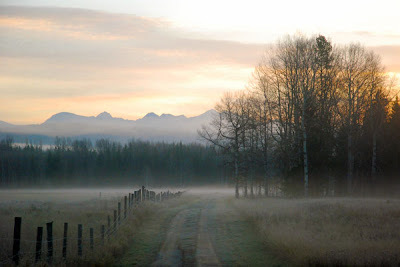 When it comes to Montana topics, I certainly have my favorites ... but even so, I strive for some geographic diversity in my blog posts. Every now and then I go looking for a photo of a town I haven't mentioned here before, like this one: a postcard image of Townsend, taken about fifty years ago. You're looking east on Broadway Street, out towards the Big Belt Mountains. 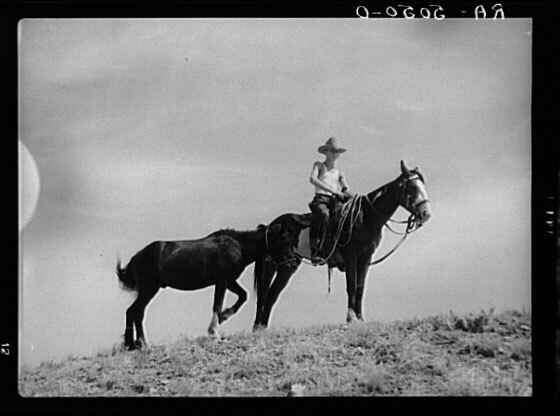 The editors of the great WPA guidebook to Montana were usually a fairly laudatory bunch, but they used the words "drab" and "neglected" to describe Townsend. That always seemed a little mean to me, but honestly, they weren't really far off the mark. The view in this photo is anything but drab, though, thanks to the now-classic cars on the street, and all those great advertising signs. I love that stuff. Technically, today's photo probably isn't the greatest, but I thought I'd continue the "driving in the rain" theme for one more day. 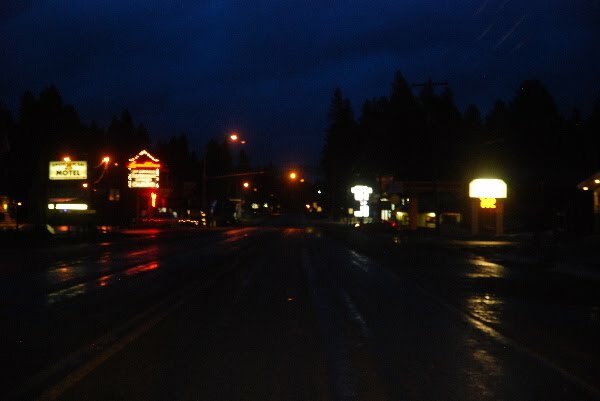 This is the main street of Lincoln, Montana, early on a springtime morning. 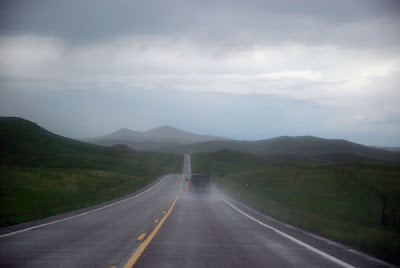 If you've read this blog for a while, you know that I never get tired of photographing Montana's roads ... usually through the windshield, while I'm zooming along. Here's another shot in that series ... I took this last June, heading north on Highway 287 between Wolf Creek and Augusta. One of my very favorite drives, even when the weather's lousy. I know I've said this before ... but Montana really has an amazing number of fine musicians, artists, authors, and poets. The number is far greater, it seems, than one should expect from a state so thinly populated and where earning a living is so difficult. And my appreciation for the state's creative talents continues to grow, as I discover more and more new voices. Bled frost and our dreams. . . .
circled and slapped, threw hoots and full cannon balls. ripe plums, wild onions, and garden-raided dirt-sweet carrots. of silver salmon and gagged smelling limburger cheese. We sipped on sour dandelion wine, felt our way up the dizzy stairs. round as our mouths—secrets—only told to our dogs. a toy chest so ﬁlled—that the lid can never be closed.